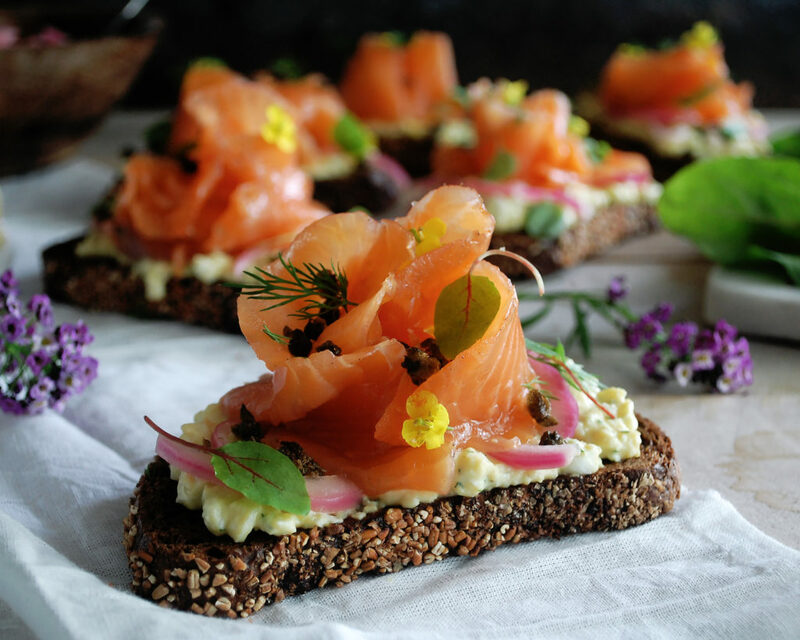 Deviled eggs and gravlax…two Easter brunch classics combined into one beautiful tartine. Easter brunch is one of my favorite meals. Especially this year since it falls a little later in the year. The weather is nicer, the flowers are blooming, and there’s that spring smell in the air, everything you want for a festive brunch. In our family, we do brunch in the morning with my mom’s side and an Easter dinner at night with my dad’s. The morning includes lots of Polish food…and I mean lots! A variety of Polish sausages, 3 different flavors of pierogis (sauerkraut being my favorite), apple and potato pancakes, hard-boiled eggs, dumplings, a big ham, and it all starts with some blintzes (fluffy little crepes filled with blueberry, strawberry, apricot, and cheese fillings). For dinner, we do another huge ham and some simple, Easter side dishes. Everyone’s always stuffed from all the food throughout the day, so we try to keep things a little lighter. We usually do a cold asparagus salad and some sort of potato dish, my favorite being a bubbling potato gratin. With all that food already, it’s hard for us to even think of making anything else. 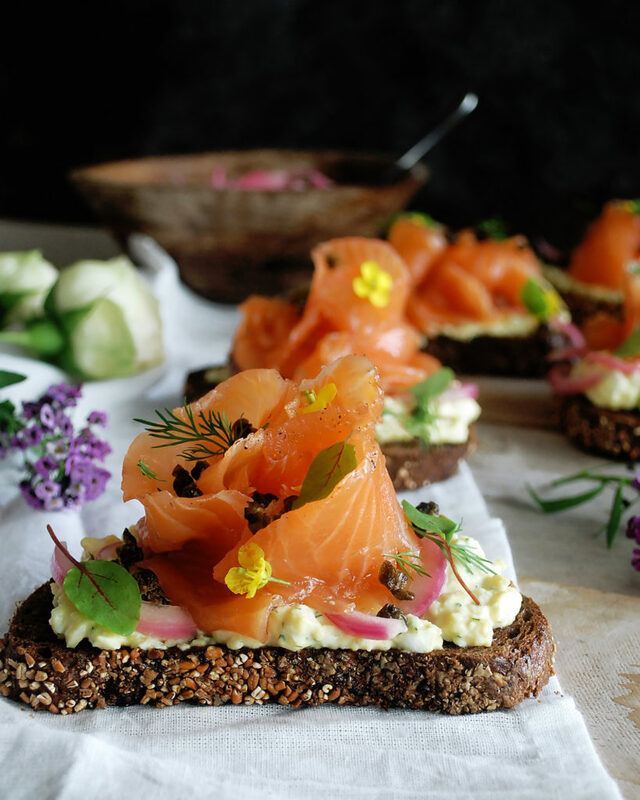 But I wanted to create a brunch tartine, one that combines two classic Easter/brunch dishes, deviled eggs and gravlax. Deviled eggs are a little bit more common, usually something you’ll find on everyone’s Easter table. 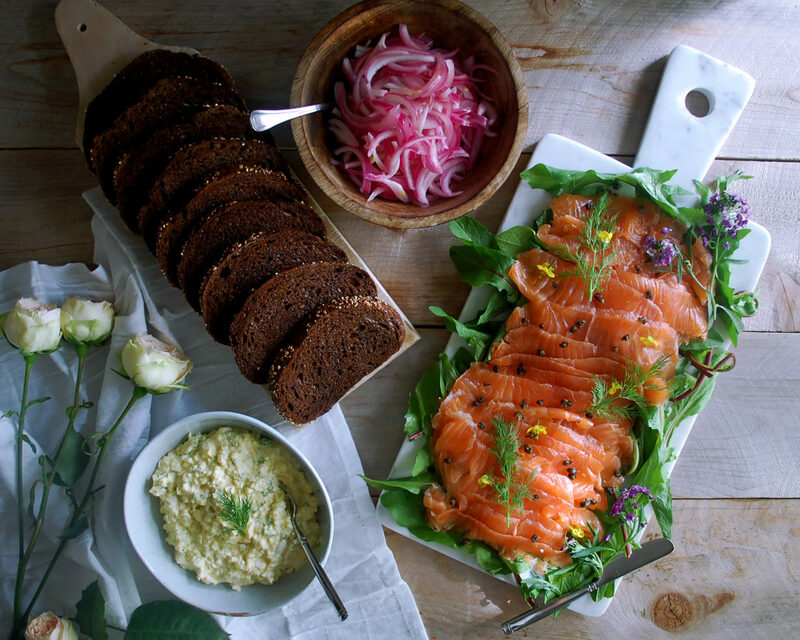 Gravlax is more of a brunch staple you’d find out at a restaurant. 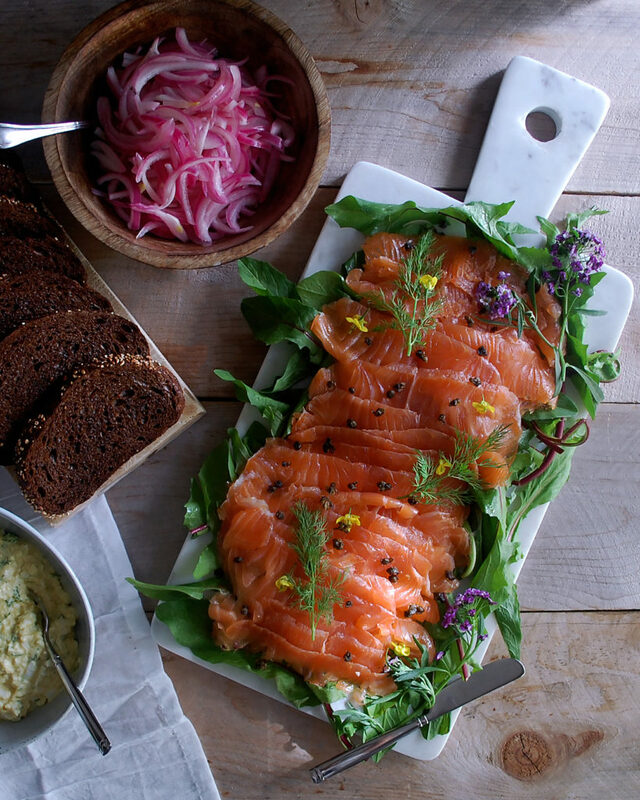 We learned how to make gravlax in culinary school, and it’s honestly the simplest thing that you might as well make your own. 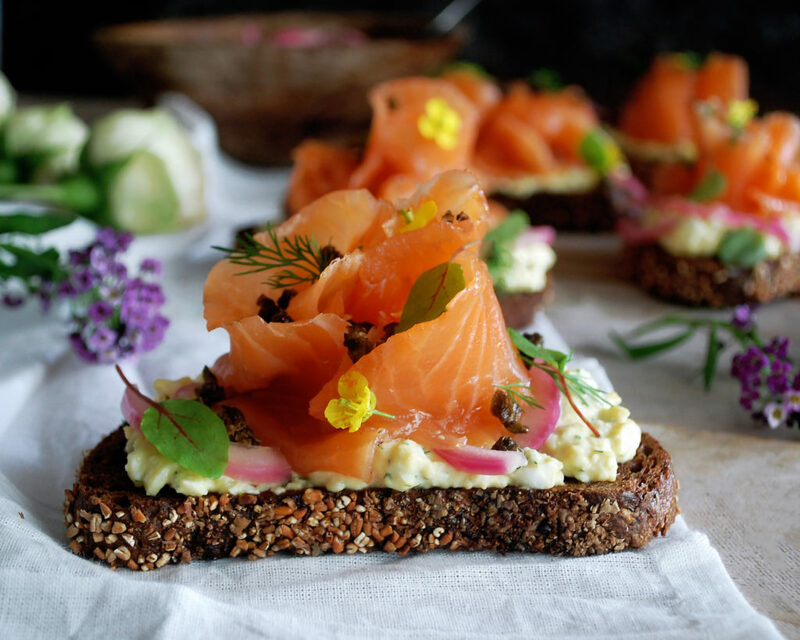 Gravlax is basically just cured salmon. It’s important to note that the salmon takes at least 3 days to cure, so definitely plan ahead for this one. You want to get a whole filet of salmon, mine equaled about 1 ½ pounds. A little lemon and gin gets brushed onto the salmon before the curing mixture (literally just salt, sugar, and black pepper) gets pressed on top. The liquid helps the curing mixture stick. I add a bunch of fresh dill over top so that all the fresh flavor infuses into the salmon as it cures. You’ll want to weigh the salmon down and wrap it well. After about 3 days in the refrigerator, it’s ready to dry and get sliced. Use a very sharp knife for slicing so you can get thin, even layers. 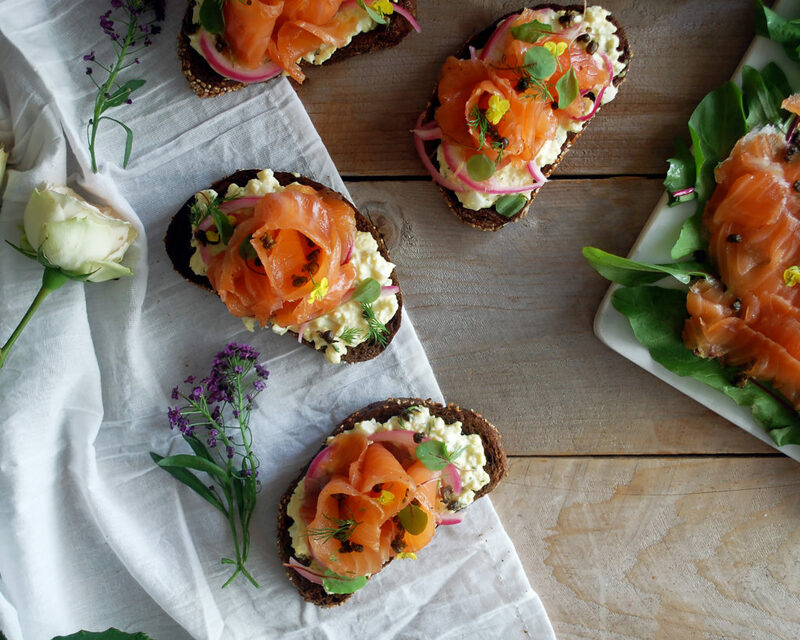 Tartine is simply the French word for an open-faced sandwich. Nothing fancy about it. I’m using pumpernickel bread because I love the flavor, but you can use any bread you’d like. The “deviled egg” spread tastes just like a deviled egg, but in a creamy, spreadable form. It gets slathered onto the bread (which I quickly toast in the oven), and the gravlax goes right on top. 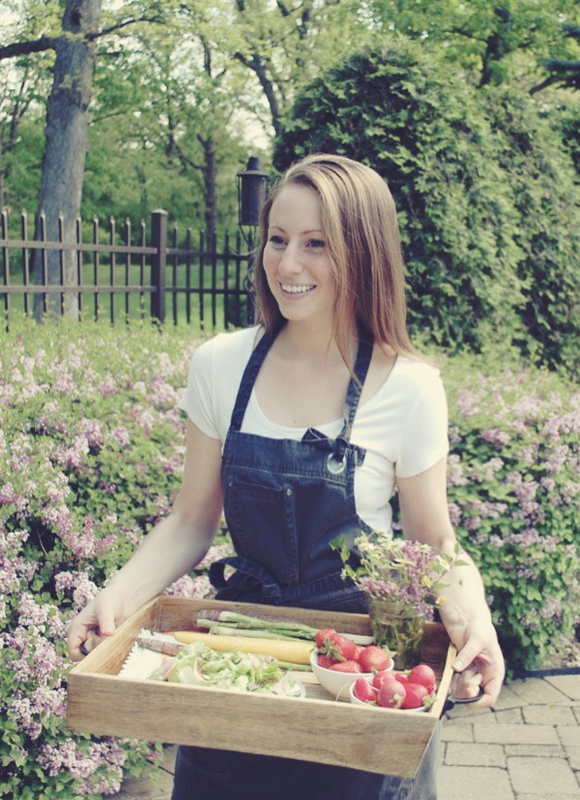 Some garnishes make this dish extra special for Easter. Pickled red onions, fried capers, and some fresh dill leaves. 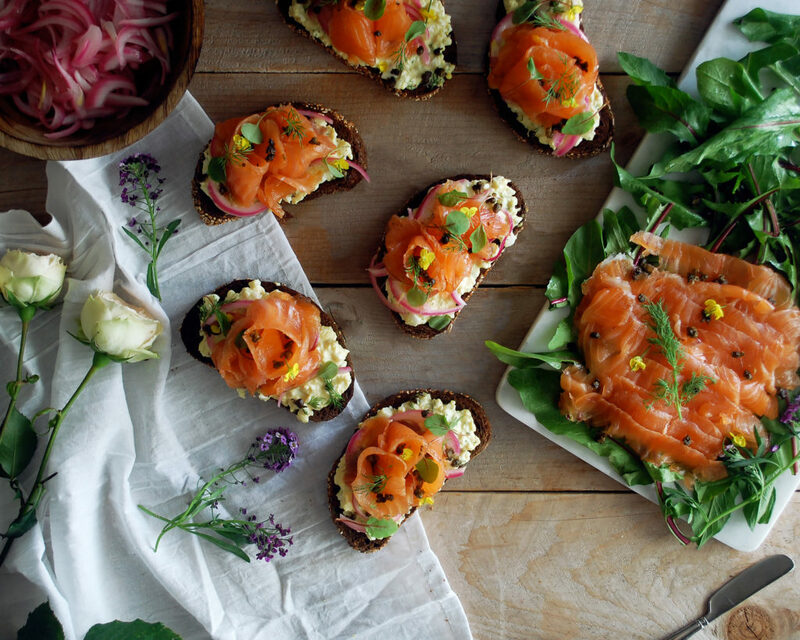 They add tang, crunch, and an herby finish to the tartines. SO good. 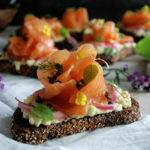 These tartines take a little time, but are well worth it to make something special for Easter brunch, so give it a try. I’ve also got the best carrot cake recipe coming up, just in time for Sunday! Place the whole salmon filet in a large baking dish or on a sheet pan, skin-side down. Brush the lemon juice and gin on top of the flesh. In a bowl, mix the salt, sugar, and black pepper together. Pack the salt mixture on top of the salmon, making sure to cover every inch. Place a piece of plastic wrap over the salmon. Use another dish to weight the salmon down. Wrap both dishes so the top one is secure. Place in the refrigerator and let cure for 3 days. After 3 days, rinse the salmon very well under cold water, making sure to remove all the salt mixture. Pat the salmon dry and let it dry fully on a rack in the refrigerator for 20 minutes. Thinly slice the salmon using a very sharp knife. Keep the gravlax chilled until ready to serve. Place the sliced red onions in a large mixing bowl. In a saucepan, combine the water, vinegar, and sugar. Bring to a boil over high heat. Turn off the heat and pour the liquid over the red onions. Make sure the onions are fully submerged. Let the onions sit, preferably with a piece of plastic wrap or towel pressed on top to keep them submerged, for 30 minutes or until cool. Use immediately or store in the refrigerator until ready to serve. Split each hard-boiled egg in half. Separate the yolks from the whites. Add the whites to a stand mixing bowl. Roughly chop the whites and throw those in as well. Add the mayonnaise, Dijon mustard, sherry vinegar, and caper liquid to the bowl. Using a paddle attachment, mix on low speed. Increase the speed to medium, and mix until the mixture comes together. You want to see small chunks of egg, but the mixture itself should be smooth. Season with salt and black pepper to taste. Mix again. 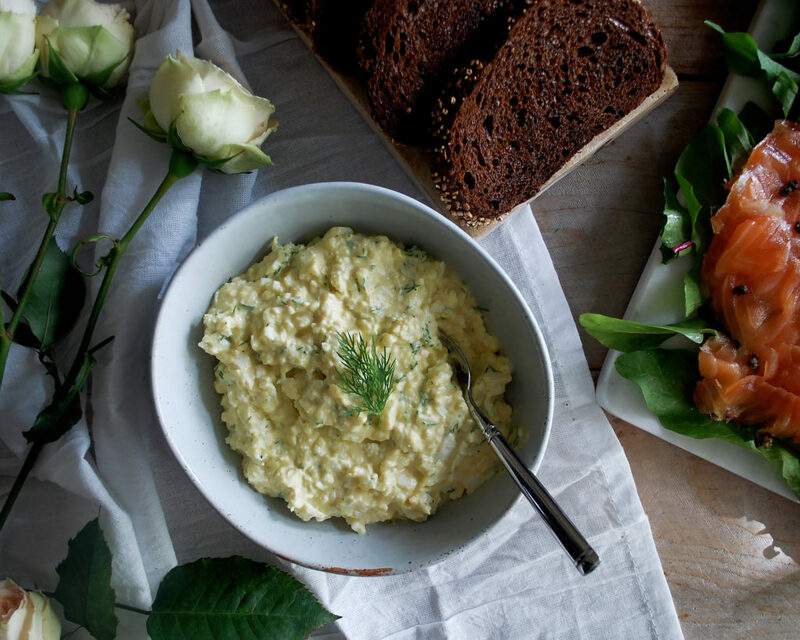 Transfer the deviled egg spread to a bowl and fold in the dill. Refrigerate until ready to serve. Preheat the oven to 400F. Slice the pumpernickel bread and arrange the pieces onto a sheet pan. Brush each piece with olive oil on both sides. Toast the bread until slightly crisp, but still soft on the inside, about 8 minutes. In a small sauté pan, add enough oil to come about ½” up the sides. Heat over medium heat. Drain the capers, and pat completely dry. Once the oil is hot, fry the capers in batches until crispy (watch them closely so they do not burn). Use a slotted spoon to transfer the capers to a paper towel. Take a piece of toasted pumpernickel and spread a generous amount of deviled egg spread on top. 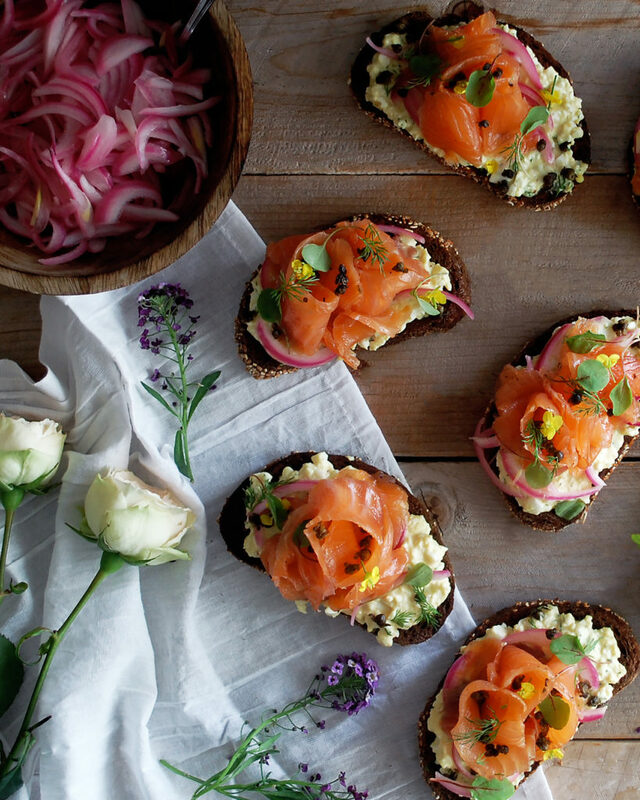 Take a few slices of gravlax and pile them on. Garnish with the pickled red onions, fried capers, and dill leaves. 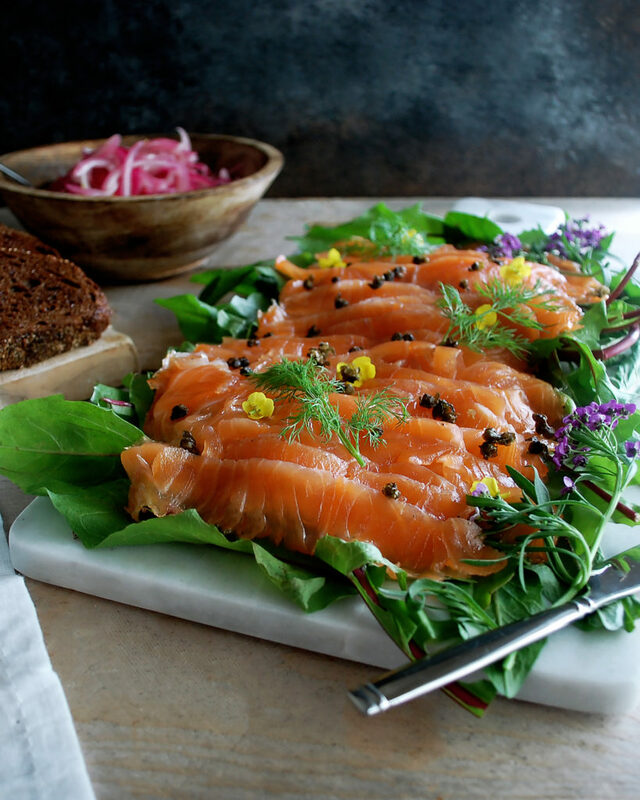 Taste the gravlax once you slice it. If it is salty for your taste, don’t add much salt to the deviled egg spread. The two components will balance each other out.